Note: we continually collect feedback on the Bureaucracy Index methodology and conduct methodological changes based on the feedback. The 2018 methodology underwent substantial changes when compared to the 2016 and 2017 editions. Results below are based on the 2017 methodology. Time: Hours per year required to fulfill all bureaucratic obligations, spent by the entrepreneur or dedicated employee of the company. Tasks: Number of bureaucratic tasks an entrepreneur or a dedicated employee of the company may encounter during one year. Activities, which are repeated during the year (quarterly, or once a months) are counted as one task. So are counted those activities, which are related to certain irregular, but inevitable event. Cost: Monetary expense on bureaucracy is counted as the time required multiplied by average employee cost in the national economy plus any fees paid, or costs of outsourcing (when the task cannot be legally done by the entrepreneur himself). The most time consuming bureaucracy was identified in the Czech Republic,, where entrepreneurs have to spend almost 200 hours annually to operate their business fulfilling all legal requirements. Bulgaria follows with 175 hours and Slovakia comes last among the trio with 164 hours. While spending less time with bureaucracy than Bulgarians and Czechs, Slovak entrepreneurs have to deal with the most tasks during year. 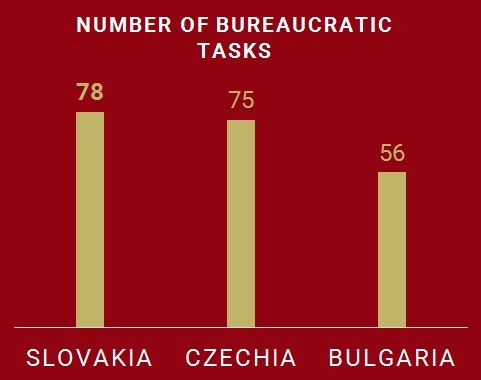 Situation in the Czech Republic is similar, Bulgarians have their bureaucratic burden chopped into substantially less parts. Slovak bureaucratic environment is the most costly of the three, with entrepreneurs spending 1651 € per year on costs related to manpower required to cope with the bureaucracy and various fees. Bulgaria offers substantially lower cost, mainly due to low average wage (less than half of Slovakia and Czechia). 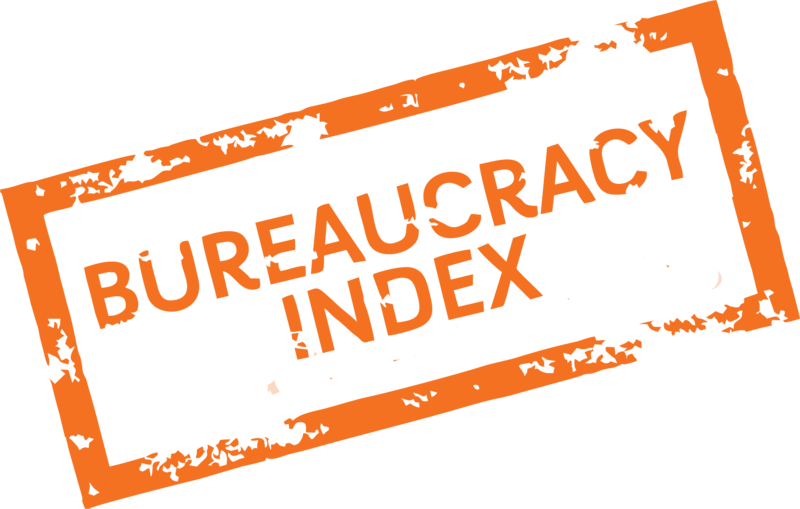 Bureaucracy Index analyses also the red tape connected with the establishment of a new model company. Two measures are followed: number of tasks and time required. The 2016 results (for Slovakia only) can be found here.